I've got my challenge card up for the latest Lawn Fawnatics Challenge- For the Guys. I decided to take things Under the Sea for this challenge. 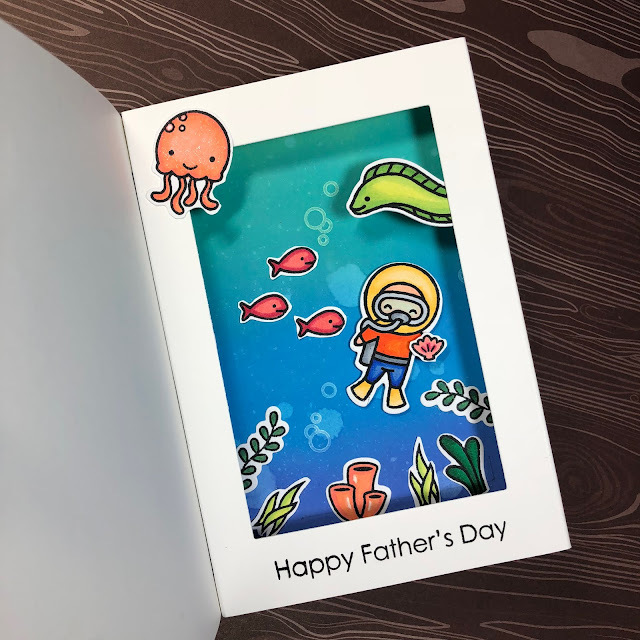 I was quite inspired by the recent Jennifer McGuire Shadow Box video and thought I would make my own featuring and underwater scene. I ended up doing this all a bit background, since I made the inside of my card first and then the outside. I would highly recommend getting anything that is meant to be stamped on the actual card front or base before assembling the shadow box components- unless you work best under pressure and stress. There were A LOT of careful maneuvers done with the sentiment stamping to make sure I didn't blow the whole card. The sentiment and manatee come from the Manatee-rific set, the top hat is from Bicycle Built for You, and the bow tie is from the Rawr set. I coloured him with Copics and added white details and highlights using a white gel pen. The background consists of 3 different aqua/teal papers cut using the stitched wave borders, all adhered to a grey circle. Most of the images come from the You Are Sublime set. The jellyfish is from So Jelly and I also used some of the kelp from Manatee-rific. Once I had my shadow box components scored, I started on my insert. I blended Distress Oxides- Cracked Pistachio, Peacock Feathers, Salty Ocean, and Blueprint Sketch. Next I misted it with my distress spray bottle- I love this since it applies a mist or larger droplets- I did a mix of both. Here they are front and inside, side-by-side! Thanks for stopping by!